Here you'll find some of the most popular products that I've developed and offered over the past few years. On the one hand there are heavy duty items I've made and found useful in three decades as a professional rigger, rigging teacher and consultant here in New England. These are the kind of things I make for workboats, trawlers, Coast Guard cutters and sailing ships such as the schooners Spirit of Massachusetts and Ernestina. On the lighter side of my shop you'll find smaller items and practical things that will come in handy on ship and on shore, made with the same tough materials and attention to traditional detail that I bring to everything I make. 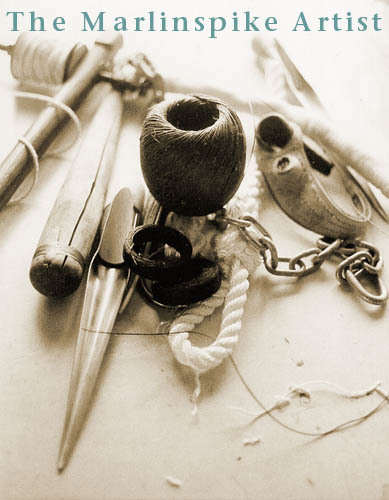 The techniques I use and my approach to working with modern and traditional cordage are laid out in my book The Splicing Handbook, published by International Marine and now in its third edition. You can find it in most marine bookstores or look it up on my "Products" page.